Quantity: 1.774.847 units (MMZ model is not included). Original price (in year 1961) 11 roubles. PK1905. 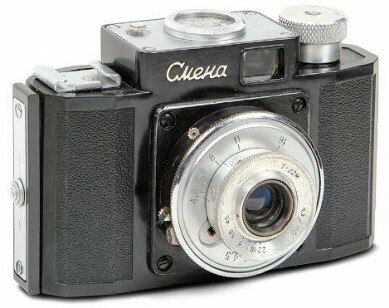 This simple bakelite camera was announced by soviet press in 1953, but I couldn't find any first year sample so far. 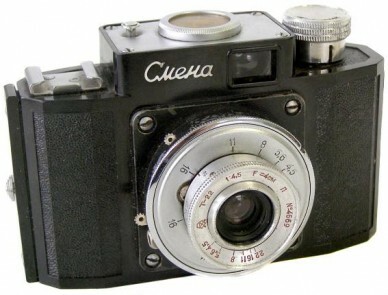 It seems, that regular production of Smena have started in 1954. Shutter plate - 51x51mm. Film advance knob -plain (groves in the middle on later samples). 4 white screws on the shutter plate. White lens faceplate with serial number (with date prefix) and Gomz logo in black/red paints. Big GOMZ logo on camera rear door. Shutter faceplate and film advance knob (without memo) white. Known camera has s/n #54176330 (SovietCams). PK1910. 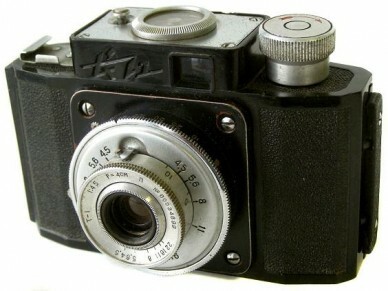 Camera identical to PK1905, but with red markings on the lens (black markings on PK1905 camera). Known camera has s/n #55275699 (SovietCams). PK1915. Camera identical to PK1905, but with new design of film advance knob already. Shutter faceplate - still white. PK1920. Camera identical to PK1915, but without date prefix in serial number already. Uncommon 4-digit serial number. Red markings. PK1925. 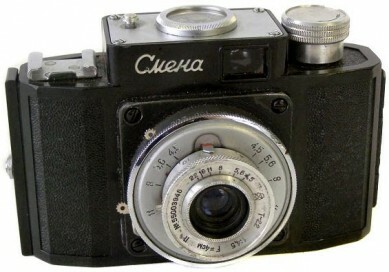 The most common version in the Smena-1 family. Enlarged shutter plate - 55x55mm already. 4 black painted screws on the frontplate. Overall body finish is bad quality in comparison with 1st version. No otherwise diferent. Some cameras may have flash synch . Happened to see version with black shutter faceplate. PK1930. 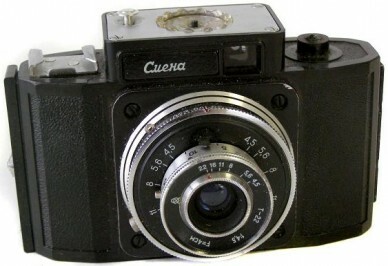 Camera identical to PK1925, but with black shutter and lens. No more serial number on the lens frontplate. Serial number and "SDELANO B CCCP" engraved in white on closing bar of the case (see picture below). PK1935. Camera indentical to Smena-2, synchronized and with selftimer. 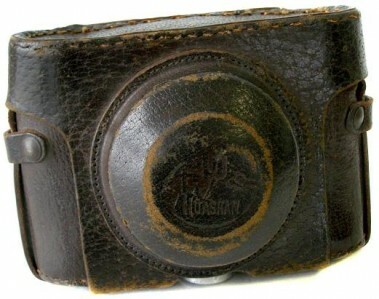 Not discount the possibility of counterfeit, but previous owner claims the camera was bought in official store many years ago in such condition. Red markings on the lens frontplate. PK1940. Unconfirmed export version, under name "Ambassador" (for United Kingdom market). PK1950. Since 1959 combined shutter release button and frame counter. Both lens and shutter faceplate are black. Film advance knob already black plastic with memo. Plastic frame counter. Serial number engraved in white on closing bar of the case. Reduced viewfinder. May exist variant with aluminum film advance knob (no memo). 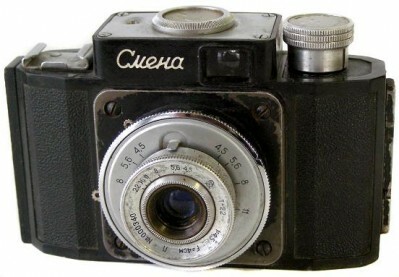 The particular camera #056681 has name markings in small Cyrillic characters. The double raised platform for name markings. PK1955. 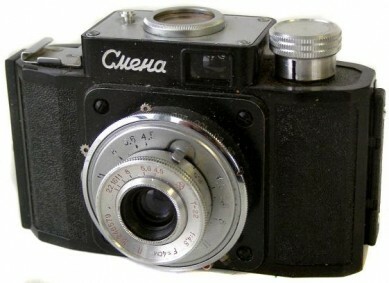 Camera identical to Smena PK1950, but with bigger name markings already. No more platform for name markings (see picture below). PB0305. 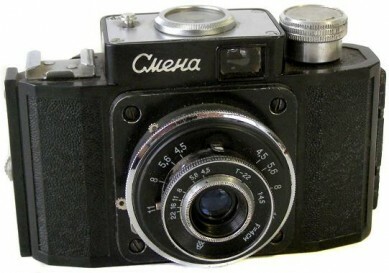 Identical copy of 1st version GOMZ Smena, but released by new soviet factory MMZ (c.1958). 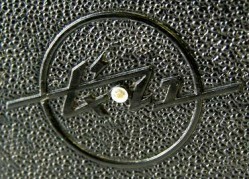 On the first bodies assembled in Minsk, the focusing ring around the lens still has the GOMZ logo . 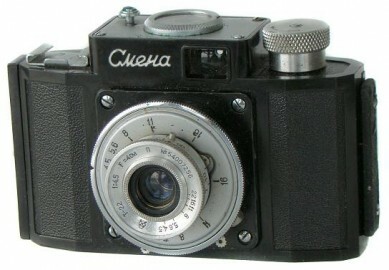 Picture of the Smena MMZ opposite was kindly sponsored by authors of famous SSK book "1200 cameras from the USSR", 2009. 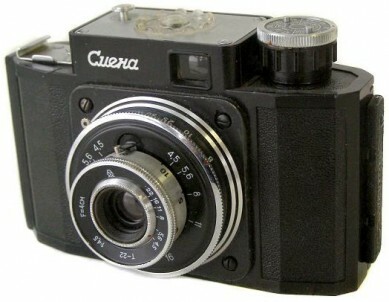 At least few very interesting Smena clones were released in China (c.1961). The particular camera comes under name Hua Shan or Huashan, which means "Sparking- Brilliant". 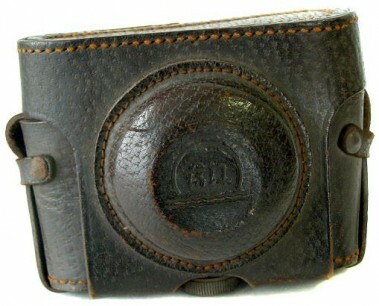 Under Smena licence produced camera, meaning Hua mountain, made in Sichuan (source Juhani Halmeenmaki). Comes with leatherette case. "HuaShan" markings in Roman characters on the case frontplate. Markings on the rear door. Another Chinese clone, under name Chiang Jiang. Chiang Jiang is another name of the Yang Tse River. 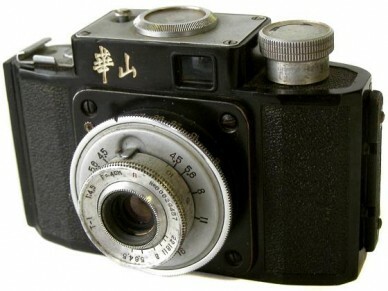 Under Smena licence produced camera "Jangtze river" was made in Xibei NW-China. At least few slightly different versions are known. The particular camera comes with leatherett case. 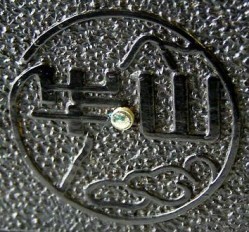 Chinese symbols on the case frontplate (see picture below).